NASA’s Curiosity rover is just beginning to explore what may be the best region on Mars for life to flourish now or in the past, according to a new analysis of the kind of Martian clays it will study. Patricia Craig at the Planetary Science Institute in Arizona and her colleagues placed microbes in test tubes with clay minerals found on the Martian surface, and left them for 195 days to sees whether they would survive. The results were encouraging, Craig says: “We didn’t kill them!” In fact, the microbes continued to produce methane when fed on only Mars-like clays, indicating that they were drawing nutrients from the material. Methane gas has been repeatedly spotted in the Martian atmosphere, and some researchers have suggested that microbes like these could be producing it. However, the changes inside the test tubes were difficult to spot, with both x-ray and infrared examinations showing no differences in the clay. Only a scanning electron microscope (SEM), which shines a beam of electrons on the sample and creates a picture from them as they reflect back, spotted any difference. The SEM was able to spot changes in the spacing of the clay mineral layers, as well as imaging what seems to be a living microbe. Curiosity has just entered a region of Mars that likely has more clays than the rest of the surface, so these results may mean that we’re rolling into the best place to spot life there. Unfortunately, SEMs are too large to fit on a rover, so even if Curiosity sees signs of life it probably won’t be able to tell what they are. The methane in Mars’s atmosphere could be produced by microbes or by geological processes like outgassing ice deposits, and without an SEM it will be nearly impossible to tell its true origin, says Craig, who presented the results of the experiment at the Lunar and Planetary Science Conference in Texas on 18 March. 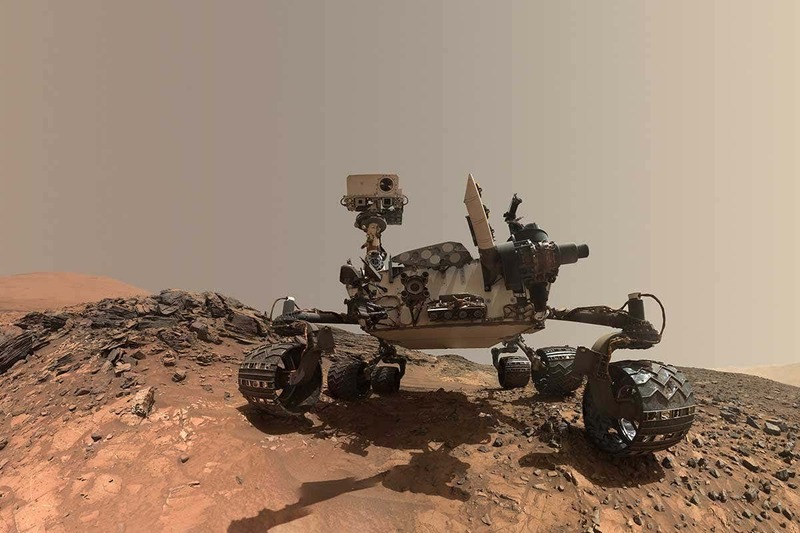 In 2013, the Curiosity rover detected a burst of methane that some thought hinted at the possibility of life. A new analysis published today in Nature Geoscience has found that orbiting Mars Express spacecraft also spotted the burst, which seemed to come just east of Gale crater, which is where the rover is now. There may be shallow ice deposits in this region that could be periodically releasing the gas, according to the new work.